Sonny grew up in Cedar Park, Texas where he graduated from Cedar Park High School. He led the Timberwolves as a “Best New Comer” to the conference with three All-District MVPS, Central Texas MVP, more than a 100 goals in his career, and was named Parade High School All-American. He played club soccer for Austin Flyers and Austin Capitals, where he was called up to the U.S. Youth U15, U17, U20 National Teams. Sonny went on to Campbell University where he earned All-Conference, Freshman of the Year, All-Conference Team, Freshman All-American, and was the second leading freshman in the country in scoring and ranked 12th overall. After his freshman year he left school and signed a professional contract with Santos Laguna of Mexico. He played for six different teams in an eleven year span - Santos Laguna, Monarcas Morelia, Merida FC, Atlante FC, Necaxa, and Dorados of Sinaloa. 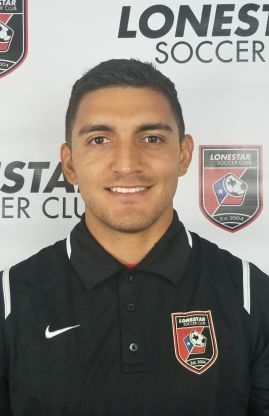 He founded APPA Aguilas in 2016 which then merged with Lonestar SC in 2017. This past year, Sonny signed a professional contract with San Antonio FC where he currently plays offensive midfield. He is also the Director of Coaching for Lonestar APPA.